The Mobile Language Team attended this years Writers Festival “Eye of the Storm – finding home in Alice Springs at the very beautiful Olive Pink Botanic Gardens on Saturday 19th September 2015. Karina Lester, Jessica Hughes and Larissa Hughes joined Josh Santospirito (multimedia artist, illustrator and writer) in launching the Yankunytjatjara Children’s Books in a multimedia presentation and reading of children’s books in the Yankunytjatjara language. The set of 20 books range from easy reading to more advanced language and are a great teaching resource. The Yankunytjatjara Wangka project in collaboration with the Mimili Anangu School, Mimili Maku Art Centre and the Mobile Language Team has been striving since 2012 to maintain the Yankunytjatjara language of the Western Desert region by working closely with senior Yankunytjatjara speakers to record the language and build it into the school. 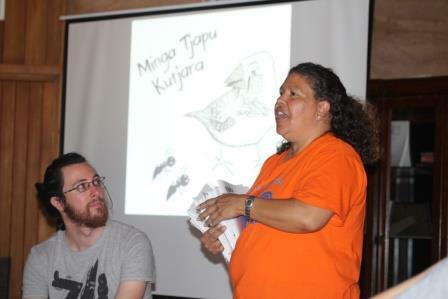 The Yankunytjatjara Wangka Project has developed great resources such as a website – wapar.com.au – and the books launch at the writers festival. The project hopes to continue up-skilling language teachers in the classroom to utilize the resources and build on their language skills.